The Skyray was one of several very good airframes developed during the 1950s that were hampered by the lack of a proper engine and in part, by a set of design requirements that resulted in its rather short operational career. The plane was a great interceptor, able to get up to altitude as fast as or faster than its contemporaries. However, it was very much lacking in the ability to carry a decent weapons load, which made it less than useful as a fighter bomber. Add to it the rapid pace of technical developments of the time and the F4D was destined to be a short lived aircraft like its contemporaries, the F3H and F7U. Despite this, it was used by a fairly good number of units, even if only for a short time and some of those are included on this sheet. First up is a VF-141 plane based at NAS Miramar in the then fairly new light gull grey over white scheme. Next a rather colorful plane of the Naval Air Test Facility at Lakehurst, NJ in 1963. This one is white and da-glo red-orange. Additional white for under the insignia has been provided for this option. 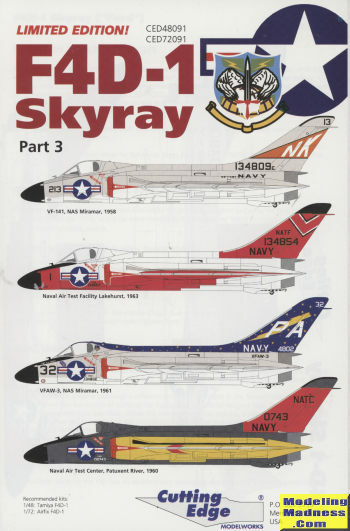 The iconic Skyray scheme from VFAW-3 based at NAS North Island in 1961 is next. All the insignia blue will need to be painted. Finally, an F4D in the drone controller scheme of engine grey, orang-yellow and daglo red-orange. A very colorful scheme. This plane was based at NAS Pax River in 1960. 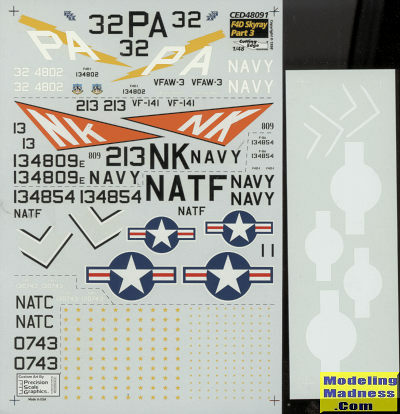 Decals are nicely printed, though you will need to find your own insignia for the VF-141 and VFAW-3 scheme as the sheets's insignia has a white surround.